A traffic collision last Friday afternoon at Timmerman Junction south of Bellevue was the first accident requiring hospital transport of a victim since a lower speed limit was put in place at the intersection 15 months ago. And even Friday's injury was considered minor. The Blaine County Sheriff's Office identified the injured woman as Delane Funk, 54, of Alturas, Calif., and reported that she complained of "minor body pain." She was taken by Wood River Fire & Rescue ambulance to St. Luke's Wood River where she was treated and released. 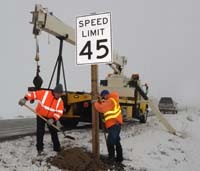 The 45 mph reduced speed limit on state Highway 75 in the vicinity of the junction was implemented in January 2011. Rules affecting eastbound and westbound traffic on U.S. Highway 20 were not changed and those vehicles are still required to stop. Friday's crash was only the second reported accident at the junction since the lower speed limit was put in place. No one required hospital transport in the earlier accident, in July. According to statistics provided by the Idaho Transportation Department, the one crash total in 2011 compares with five in 2010 and three in 2009. Injuries were reported in two of the 2010 accidents and in two of the 2009 crashes. Blaine County Sheriff's Capt. Curtis Miller said he believes the lower speed limit has improved safety at the junction because it gives drivers on Highway 75 more time to assess what's coming at the intersection and more time to react if there's a problem. While ITD has said it is pleased with the reduction in accidents, the agency is not ready to take credit for making the intersection safer. "This is a good sign," ITD spokesman Nathan Jerke said. "We're happy to see the reduced number of crashes, but it will take a long collection of data before we can say anything with certainty. One year of data isn't enough to say that the reduced speed limit has caused the reduction in crashes." Jerke said increased law enforcement and public awareness about the dangers of the intersection might also be factors in accident reduction. Friday's crash was typical of accidents at the junction. Someone from out of state, eastbound or westbound on Highway 20, dutifully stopped at the stoplight and then proceeded into the intersection to be hit by a north or southbound vehicle on Highway 75. Miller said Funk, eastbound at about 1:45 p.m. and driving a green 2000 Honda CRV, did just that and her vehicle was hit on the passenger side by a northbound green and white 1997 Ford F250 driven by Bruce Thacker, 51, of Jerome. "She believed it was a four-way stop in the middle of nowhere," Miller said. Large signs on Highway 20 state "Cross-traffic does not stop." "No citation has been issued at this time, pending further investigation," Miller said. An accident report did not state whether any of the parties was wearing seatbelts.